Saint Johns Wort is clinically proven to promote a healthy brain chemical balance to address symptoms of depression and anxiety; VitaStrength’s 500 mg St. John’s Wort supplement is standardized to .3% hypericin, giving you more of the active natural chemical that gives the herb its mental health benefits. 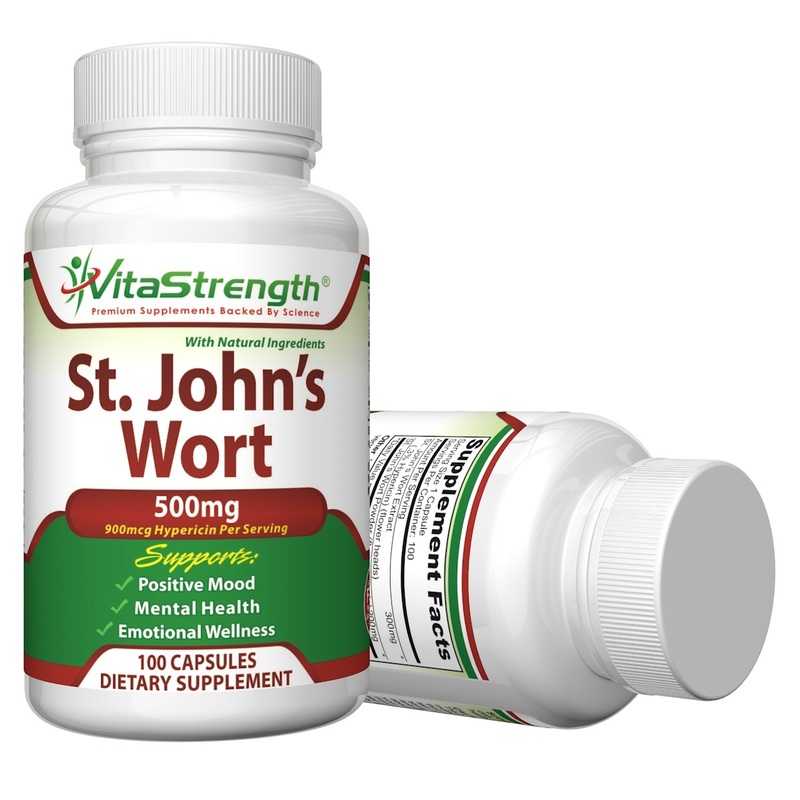 Order VitaStrength’s St. John’s Wort today. 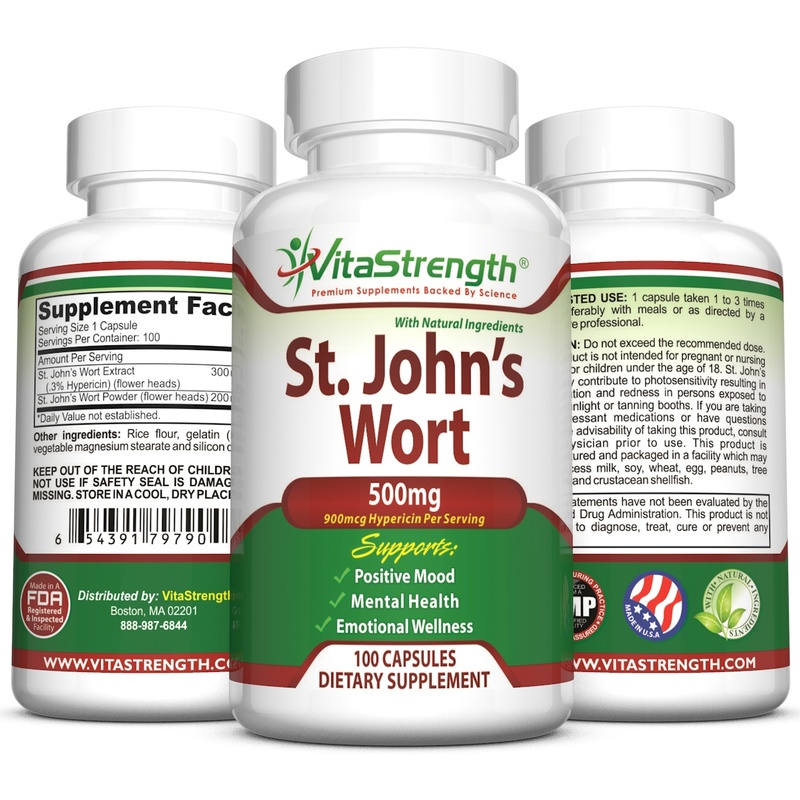 A NATURAL (NON-GMO) SOLUTION FOR OUR WELL-BEING: Saint Johns Wort is clinically proven to promote a healthy brain chemical balance to address symptoms of depression and anxiety; Our St Johns is completely free of chemical additives to give you a truly natural remedy. MORE POTENT FOR BETTER MOOD SUPPORT: Our St. John’s Wort supplement is standardized to .3% hypericin, giving you more of the active natural chemical that gives the herb its mental health benefits. 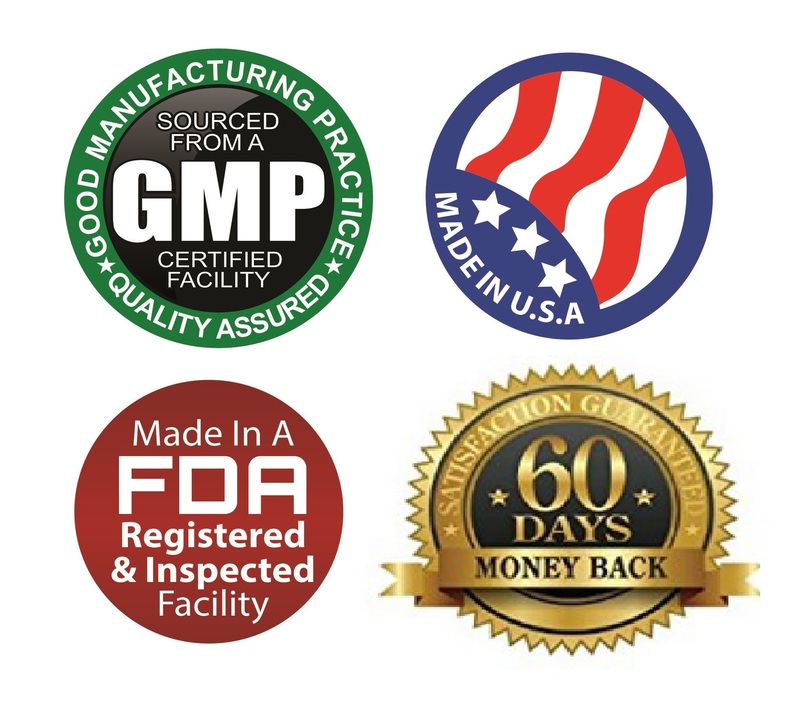 UNPARALLELED QUALITY: Our St. John’s Wort extract is made in the USA at GMP certified, FDA Inspected and Approved facility, ensuring that it is as pure as possible. 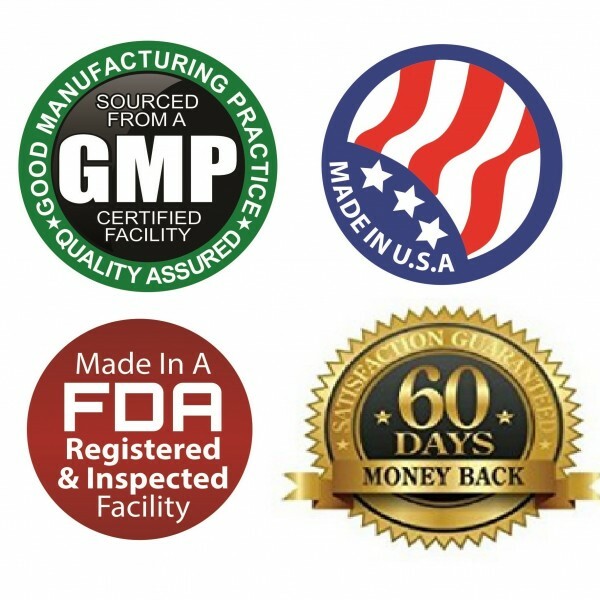 SATISFACTION GUARANTEED: We stand behind the quality of our St. John’s Wort supplement fully. The flowers and leaves of the St. Johns wart or St John’s Wort plant have been used as a natural remedy for medical conditions for centuries. Now, modern science has established that a natural chemical present in St Johns called hypericin is capable of improving mental health and overall well-being by helping to balance the chemicals present in the brain. If your doctor has recommended that you add St John’s Wort extract to your diet so that you can benefit from hypericin, VitaStrength’s St. John’s Wort is the ideal supplement to choose. Get the mood support that you need to be at your best every day with the finest quality St John’s Wort supplement. 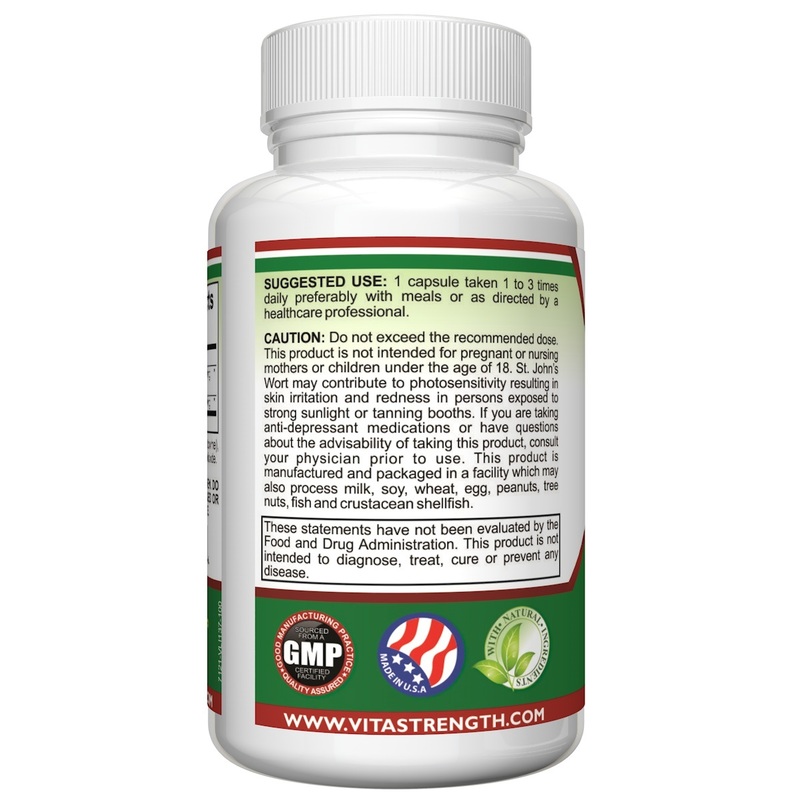 Order VitaStrength’s St. John’s Wort today. I’ve tried several supplements from Viga Strenght, and have been happy with all of their products. This St John’s Wort supplement is made in america and contains quality ingredients. Overall great product. My sister has been suffering from anxiety and stress for a long time. I was worried about her and was looking to alternative medicines because that’s what she cares about. She does not want synthetically made products in her body, which I respect. So after doing a couple hours of research, I found a lot of good information on St. John’s, in addition to a number of plant-based medicines. I found this one has good review and jumped on it. She’s been taking it for a few weeks now and feels good. Along with this supplement, some personal reinforcement and meditation, she says it’s really helping. •Solid Dosage: With 500mg, part extract and part powder of the flower it is the commended dosage for treating anxiety and stress. • Plenty of Pills: The bottle comes with 100 capsules which will last her 3 months. • Perfect Price: At this price and the number of pills, it really 15 cents a pill. This is much cheaper than anything you would find through a prescription from a doctor and this is relatively the same price as other Amazon products, if not cheaper than many. • Made in the US: I don’t know how to verify this, but it’s made in the US, which is really a bonus for me. I feel like I’m helping both my sister and someone out there who’s making it. • Money Back: We’re not going to send this back (unless she gets some allergic reaction or something) because so far she likes it. Though, it’s nice to know there’s a money back guarantee. I recently decided to stop taking psychiatric medication and instead take natural supplements to deal with my anxiety and depression. I’ve been taking St. John’s Wort for several weeks now and it’s made a huge difference. My depression is the best it’s been in my entire adult life. I’m amazed at how much it’s helped! Taking St. John’s Wort has helped more than any psychiatric medication I’ve ever tried. I no longer feel like I need to cry several hours a day. I have energy and actually want to do things. I feel like a new person! I wish I had tried the natural route many years ago instead of suffering through side effects from various medications that didn’t help. I live in rural Idaho where we receive all four seasons and within the winter month very little sunlight. I get what many people call the “winter blues”. I have a tendency to get extremely depressed and that’s where St. Johns wort comes to the rescue. 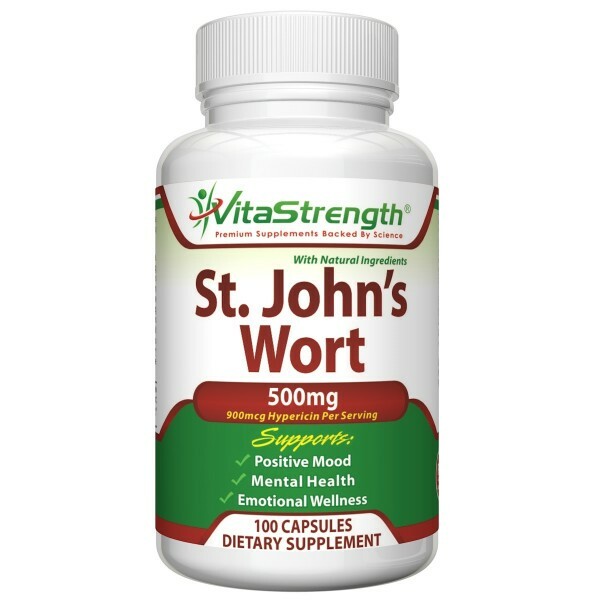 The VitaStrenght St Johns wort in 500mg capsules has saved my emotional state and well being. This 500mg is more than enough to help me out. Traditionally I have to take the lesser milligram capsules because I’m unable to find a higher milligram dosage. That’s in the past, now I’ve got these pills and loving it. I’ve noticed an increase in mental clarity as well as an increase in my happiness. These pills can be taken year round; however, in my case I generally only take them in the winter months. The higher milligram dosage has definitely put a little pep in my step and has me smiling again. I’m glad I found these pills and the benefits are amazing. Higher dosage equals less pills consumed equals a happy me! Finally, I have found all natural way to help with my depression and anxiety. I feel so much better after starting this and I can’t wait to see the long-term effects. St. John’s Wort is really an excellent supplement. It promotes an overall feeling of well being. It helps with moods and depression and gives me clarity. I like to take this along with Ginkgo Biloba. They work very well together! This is an easy supplement to take, and it comes with no aftertaste or side effects. After all, it is all natural. It is also in an easy to swallow capsule. I highly recommend St. John’s Wort, especially if you have memory issues, depression, anxiety, or just need a pick me up to get through your day. This is a wonderful supplement that works! This supplement was purchased for mood and I have been taking one a day. The pills are not too large and easy to swallow. They have no aftertaste. I usually take one in the morning. I haven’t seen any negative effects from taking this product. I feel like they have given me energy. I have been taking them about a week so will give an update at a later date. Update: I have been taking these pills for ove 2 weeks now and am really surprised that my mood has changed in a good way. I feel more positive and just less irritated. I really didn’t expect this to work. My dreams seem to have gotten more vivid and strange which is ok just weird. I do not believe this is in my mind because I had no high expectations from this product and have seen a change They say it can take weeks or months to see a difference and I saw one in 2 weeks! Great size bottle for the price. St John’s wort is good with helping naturally with mood and mental balance. Better for you than prescription drugs that mask the problem! I came across the item being very useful within maintaining healthful lifetime. I would recommend that to a single in which desires to become pro energetic regarding presently their health. This kind of certainly is worth it. You do not become disappointed. Up to now the item looks like it’s helping us with the help of the item as a brand-new dietary supplement when i experience far more dynamic. The idea acquired no after taste. I have obtained the item a couple of nights and have absolutely really begun to detect a difference. I’m quite a bit-less irritated because normal in addition to, I’m sleeping far better through the night. Let me update sometime soon about how precisely the item is still operating on the stop with the jar. I adore this supplement in addition to enjoy which you just have to carry 1 pills because he or she will not love to carry almost any supplements by any means. 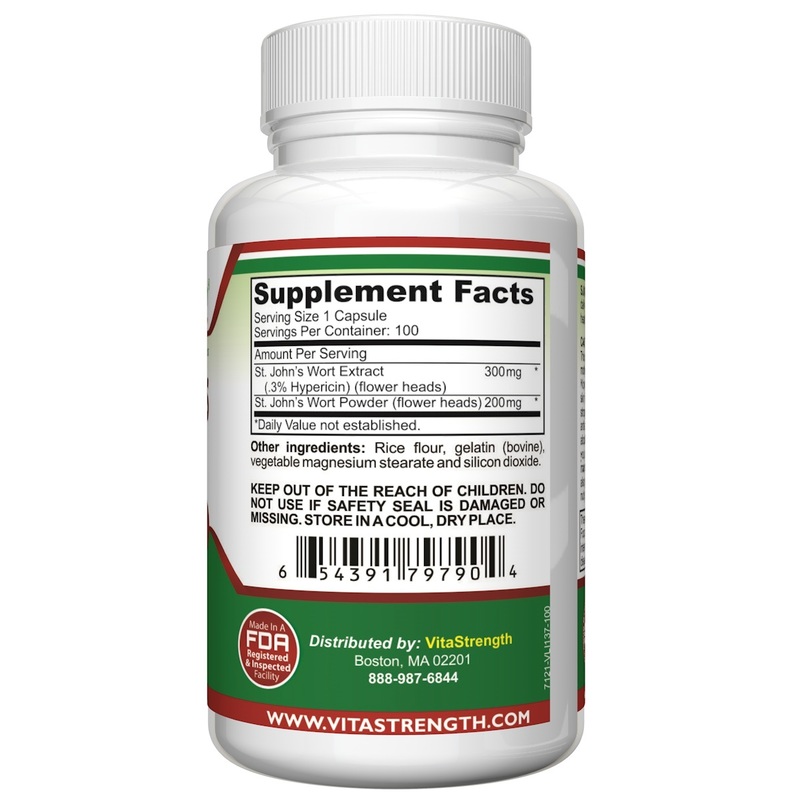 VitaStrength’s St. John’s Wort is a very high-quality product. The capsules are easy to swallow and leave no awful aftertaste after taking them. These are good to take when suffering from stress or depression (of course, under a doctor’s supervision). I use them in other herbal preparations I make that don’t require to be taken internally. The powder inside the capsules is gray in color and they are a very fresh product. VitaStrength’s St. John’s Wort is a very high-quality product. Super fast shipping! Item exactly as described.I am new to Vita strength and I’m excited to try this product. Easy to swallow tablets, no after taste. This product claimed to help me feel better. I will try it and update the result later. started having mood swings with perimenipause. I started taking St Johns wort and it helped alot. These are great as they are a good dosage and don’t upset my stomach. There are certain times in my life when I really need this, and for me, it is priceless. I have tried several other brands and strengths, but they have all been too strong for me. This one is perfect. I would write lots more about how great it is and how it helps me, but VitaStrength prefers general statements. Google the usefulness. I’m so happy I found it. The only reason I gave it four stars (leaves) instead of five under “quality” is because it has a gelatin cap and not a non-animal source cap, like cellulose. I hope VitaStrength will make the switch to vegetable-based caps very soon. Although the Gelatin made from bovine which is beef based but not many prefer meet based gelatin. The price for this is incredible, too. Highly recommend! Easy to swallow tablets, no after taste. Both which are important for me. have loved using St John’s Wort for years now, I suffer from periodic anxiety and depression. I really struggle the most in the winter months with the seasonal depression and using St. John’s Wort provides great relief during those months along with religiously taking my Vitamin D. Love the support given by this supplement for mental health and emotional wellness. This supplement is a life saver compared to some drugs the doctors have prescribed. Would go the natural herbal route any day compared to prescription drugs! Super fast shipping! Item exactly as described. I decided to try this out because I’ve had issues with depression and anxiety which have gotten pretty bad but I wanted to take something natural over a chemical antidepressant. I’ve taken it for a few days and have actually started to notice a difference. I’m not as grumpy as usual and I’m sleeping better at night. I will update in the future about how it still is working towards the end of the bottle. I struggle big time with anxiety and depression. I was excited when I saw this product because I feel like it is a lot safer than the pharmaceutical drugs that I am taking now. When taking knees I feel a lot more relaxed in take when I feel anxiety attack coming on. So far I am extremely happy with the results of this. I am always willing to try anything to help my health and was especially happy with how natural the product is. This came extremely fast after ordering. Great mood lifter. These St John’s Wort supplements, are wonderful. They really do help your mood. If I skip a pill, I can totally tell that it was missing. Pill goes down easily too. No after taste. St. john’s Wort is great for a balanced mood, better sleep, overall wellbeing and Vitastrength does not disappoint. This has helped my anxiety substantially. I noticed a big difference after only using it for a couple days. I wont go without this supplement ever again!